The 2018 Annual Prize Giving Dinner was held in the Killiney Room of the Graduate last night the 16th November. 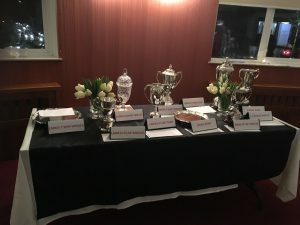 An excellent meal was enjoyed by all who attended and this was followed by the presentation of trophies etc by our President Rita. You can see photos of the event in the “Gallery”. A number of prize winners were unable to attend. In her closing speech our President thanked Anne Brophy, Hazel Higgins, and Greg Mulhall for the excellent job they did in running the competitions.